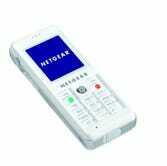 The Netgear Skype WiFi phone SPH101 just popped up on Amazon, finally! You'll still have to wait until June 30 to receive one, and it's not cheap, either—even though the list price is $300, it'll still cost you $249.99. The great thing is, you don't need a PC to use it, you can call anyone in the world on Skype for free, and all you need is a WiFi hotspot to do it. Of course, it's not all a bed of roses; if you want to use this Skype WiFi phone on your wireless network at home, you'll have to open up that network to the rest of the world, because, of course, hotspots requiring web-based authentication are not supported. But still, it's hard to compete with free, and that's just what Skype is.